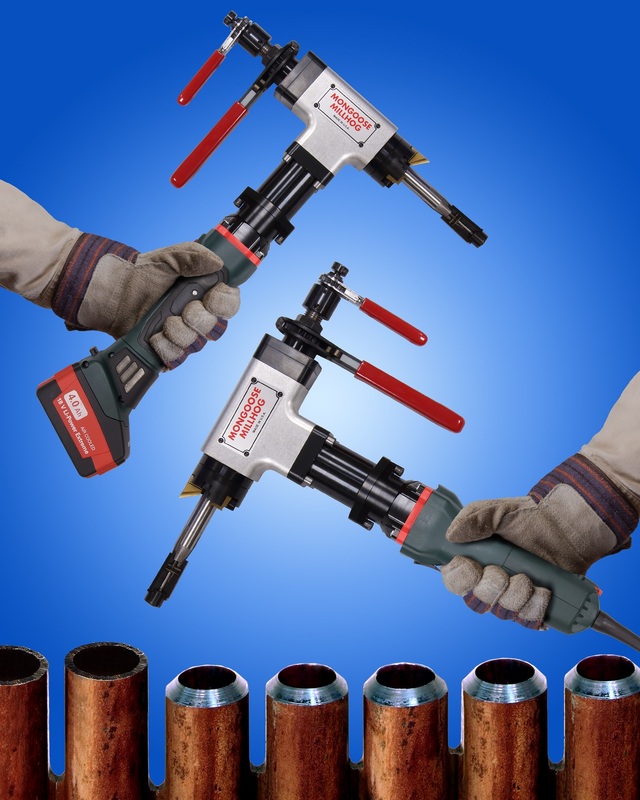 A line of welding end prep tools that are now available in battery and electric powered models for machining tube and pipe where air is not available is being introduced by ESCO Tool of Holliston, MA. The ESCO Mongoose MILLHOG® is a self-centering right angle drive I.D. clamping tool that now comes in a rechargeable 18 V battery powered model for true portability and a 950 W electric motor for use where air is not available. Only requiring 2.25” minimum clearance for beveling tube and pipe from 5/8” I.D. to 3” O.D., these tools are ideal for getting into tight spaces and provide chatter-free operation without cutting oils. Featuring TiN coated cutter blades that mount securely in a wedge-style blade locking system and have a radical chip breaker that directs the chip away from the surface to minimize heat generation, ESCO Mongoose MILLHOG® tools only require nine sets of clamps for their entire range. Either power option can be field-retrofit to the pneumatic tool by changing four bolts. The ESCO Mongoose MILLHOG® is priced from $4,195.00 complete. Battery and electric motors can be purchased separately to retrofit pneumatic models.